For teachers, Outlook has many tools that are easy to use but effective in multiple ways. 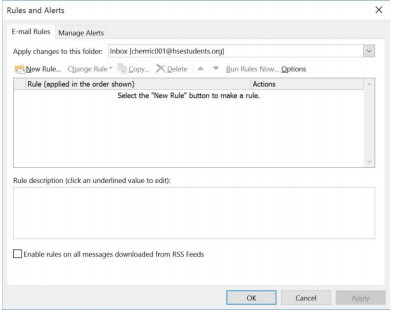 The following tutorial will help you create a rule that produces a special alert when a student sends an email indicating that they need help on an assignment. For this example, I will be creating a rule that simply searches the subject line of an email. Keep in mind that more advanced rules can be created just as easily. ​Outlook comes pre-installed on every computer that has the Microsoft Office 365 Suite. This means that any school owned computer that has Microsoft Word will have Outlook. Outlook is also just as easy to install on a personal computer. To open it, find the icon that looks like this and click on it. If it is not there, search for it by pressing the Windows key on your computer and then searching “Outlook”. Once Outlook is open, an icon should be displayed at the top of the screen that is labeled “Rules”.​Click on the Icon. ​​ A drop down menu will then be displayed. Click on “Create Rule”. After clicking “Create Rule”, a new window should open up that looks like this. Here you will find simple conditions that can be set up. Clicking on one or more of the top boxes will enable the condition. Clicking one or more of the bottom boxes will enable a result. 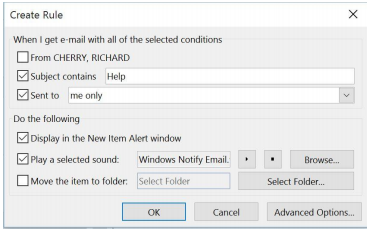 ​In this example I am making a rule to alert me if a student needs help with an assignment, so I want every email with the subject “Help” to produce an alert. ​You can then press OK and the rule is set! Clicking on the Advanced Options tab will give you a more specific set of conditions and results to set. Feel free to play around to get your rules set just right! There are no limits as to how many you can have! ​Disabling rules is as easy as creating them. To do this, click on the Rules dropdown menu as instructed in Step 2. In this menu, you will find an option that says “manage rules and alerts”. Clicking on this tab will open a window where you can manage your Rules that looks like this.